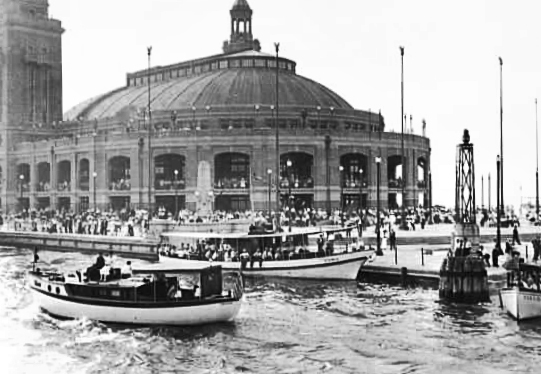 July 15, 1916 – The $4,000,000 Municipal Pier is dedicated with between 50,000 and 100,000 people in attendance and a thousand automobiles parked between the long freight sheds on the pier. The Chicago Daily Tribune reports, “In spite of the heat thousands walked to the pier and walked the full length of it, through the freight sheds, to the launch landing. Launches and steamers took limit loads of passengers on moonlight trips. The most popular spots with the younger couples proved to be the two towers. A continual procession climbed up the dozen or more flights of the spiral stairs, as well, to the utmost balcony.” [Chicago Daily Tribune, July 16, 1916] There were no formal dedication ceremonies. July 15, 1934 – On a perfect summer day with an Italian-American program as the day’s highlight, 112,000 paid fair-goers attend the Century of Progress World’s Fair on the lakefront. 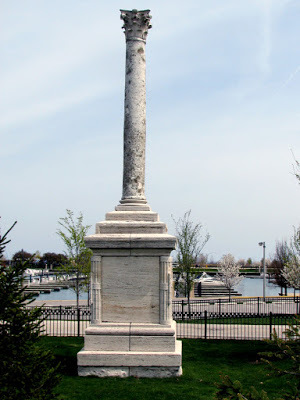 The highlight of the day is the unveiling of a marble column from the ancient Italian city of Ostia, a gift of Italian Premier Benito Mussolini to commemorate the visit of General Italo Balbo’s flight to Chicago a year earlier. Balbo makes a speech via short wave radio to 3,000 persons at the Italian Pavilion. The speech is preceded by a parade of 150 Italian societies dressed in national costumes.